A woman’s life spirals out of control when she discovers strangers moving into her home—a home she didn’t sell—her husband, sons and everything she’s ever owned, vanished. Fi Lawson loves her home in the coveted Alder Rise neighborhood, which she shares with her husband Bram and their two boys, Harry and Leo. One night, one mistake too many, however, severs marital trust, causing Fi and Bram to separate. Divorce is on the horizon, but in the meanwhile, Fi and Bram agree to a modern “bird’s nest” arrangement where the boys remain in the family home and the parents alternate their time between the primary home and a shared secondary flat. Their crumbling marriage is the least of their troubles when compared to the secrets Bram hides… the secrets which become the catalyst for their ultimate unraveling. It’s a catastrophic domino effect of lies, crimes and cover ups, all which dig Bram, and by default their family, deeper into a hole impossible to scale. By the time Fi discovers strangers moving into their home, the nightmare that’s transpired is sufficient to bring their family, nest and future to ruination. 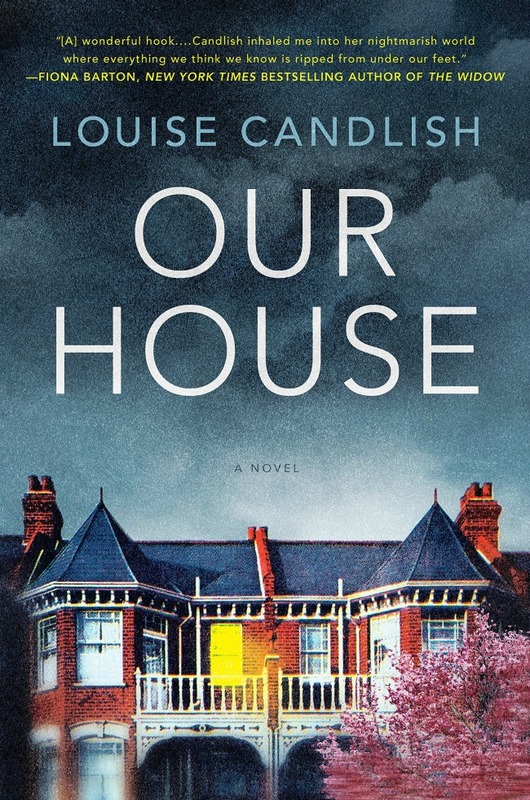 Candlish has woven a unique, albeit often complex, narrative teeming with twists. The premise is entirely plausible, making it all the more disturbing and terrifying. 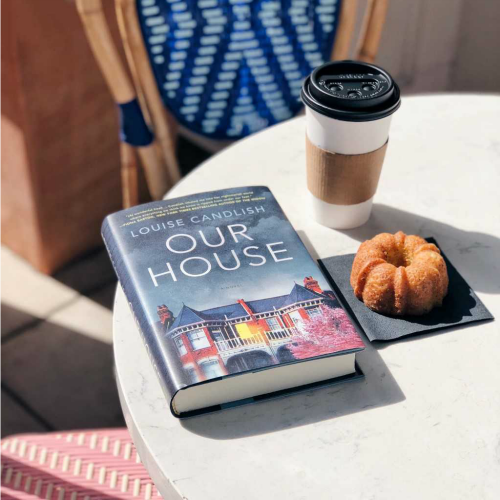 It’s a compelling, compulsive domestic suspense with a really fresh story line that will stick with you long after you’re done. While I read the hard cover, I bet this will be a great book to binge on Audible. The van is parked halfway down Trinity Avenue, its square mouth agape, a large piece of furniture sliding down the ribbed metal tongue. Fi watches, squinting into the buttery sunlight—rare for the time of year, a gift—as the object is borne shoulder high by two men through the gate and down the path. No, that’s illogical; of course it can’t be her house. It must be the Reeces’, two down from hers; they put their place on the market in the autumn and no one is quite sure whether a sale has gone through. The houses on this side of Trinity Avenue are all built the same—redbrick double-fronted Edwardians in pairs, their owners united in a preference for front doors painted black—and everyone agrees it’s easy to miscount. Once, when Bram came stumbling home from one of his “quick” drinks at the Two Brewers, he went to the wrong door and she heard through the open bedroom window the scrambling and huffing as her inebriated husband failed to fit his key into the lock of number 87, Merle and Adrian’s place. His persistence was staggering, his dogged belief that if he only kept on trying, the key would work. “But they all look the same,” he’d protested in the morning. Her step falters: the magnolia. It’s a landmark, their tree, a celebrated sight when in blossom and beautiful even when bare, as it is now, the outer twigs etched into the sky with an artist’s flair. And it is definitely in the front garden of the house with the van outside. Think. It must be a delivery, something for Bram that he hasn’t mentioned to her. Not every detail gets communicated; they both accept that their new system isn’t flawless. Hurrying again, using her fingers as a sun visor, she’s near enough to be able to read the lettering on the side of the vehicle: prestige home removals. It is a house move, then. Friends of Bram must be dropping something off en route to somewhere. If she were able to choose, it would be an old piano for the boys (please, Lord, not a drum kit). But wait—the deliverymen have reappeared and now more items are being transported from van to house: a dining chair; a large, round metallic tray; a box labeled fragile; a small, slim wardrobe the size of a coffin. Whose things are these? A rush of anger fires her blood as she reaches the only possible conclusion: Bram has invited someone to stay. Some dispossessed drinking pal, no doubt, with nowhere else to go. (“Stay as long as you like, mate—we’ve got tons of room.”) When the hell was he going to tell her? Well, there’s no way a stranger is sharing their home, however temporarily, however charitable Bram’s intentions. The kids come first: Isn’t that the point? Lately, she worries they’ve forgotten the point. She’s almost there. As she passes number 87, she’s aware of Merle at the first-floor window, face cast in a frown, arm raised for her attention. Fi makes only the briefest of acknowledgments as she strides through her own gate and onto the tiled path. And Fi finds herself being ushered through her own door, into her own house, like a guest. She steps into the broad, high-ceilinged hallway and stops short, dumbstruck. This isn’t her hall. The dimensions are correct, yes; the silver-blue paint scheme remains the same and the staircase has not moved; but the space has been stripped, plundered of every last item that belongs in it: the console table and antique monks bench, the heap of shoes and bags, the pictures on the walls. And her beloved rosewood mirror, inherited from her grandmother, gone! She reaches to touch the wall where it should be, as if expecting to find it sunk into the plaster. “What have you done with all our things?” she demands of Lucy. Panic makes her strident and a passing mover casts her a correcting sort of look, as if she is the threatening one. “I did nothing of the sort. I need to look upstairs,” Fi says, shouldering past her. “Well . . .” Lucy begins, but it isn’t a request. Fi isn’t seeking permission to inspect her own home. Having climbed the stairs two at a time, she pauses on the upstairs landing, hand still gripping the mahogany curve of the banister rail as if she expects the building to pitch and roll beneath her. She needs to prove to herself that she is in the right house, that she hasn’t lost her mind. Good, all doors appear to lead to where they should: two bathrooms at the middle front and rear, two bedrooms on the left and two on the right. Even as she lets go of the banister and enters each room in turn, she still expects to see her family’s possessions where they should be, where they’ve always been. But there is nothing. Everything they own has vanished, not a stick of furniture left, only indentations in the carpet where twenty-four hours ago the legs of beds and bookcases and wardrobes stood. A bright green stain on the carpet in one of the boy’s rooms from a ball of slime that broke open during a fight one birthday. In the corner of the kids’ shower stands a tube of gel, the one with tea-tree oil—she remembers buying it at Sainsbury’s. Behind the bath taps her fingers find the recently cracked tile (cause of breakage never established) and she presses until it hurts, checking she is still flesh and bone, nerve endings intact. Everywhere, there is the sharp lemon smell of cleaning fluids. Returning downstairs, she doesn’t know whether the ache has its source inside her or in the walls of her stripped house. The kitchen too is bare but for a table and chairs Fi has never seen before, and an open box of tea things on the worktop. Lucy is thoughtful enough to push the door to so as not to offend her visitor’s eyes with the sight of the continuing invasion beyond. Fi takes the phone and orders her eyes to focus. The first e-mail is from seven days ago and appears to confirm the exchange of contracts on 91 Trinity Avenue, Alder Rise, between David and Lucy Vaughan and Abraham and Fiona Lawson. The second is from this morning and announces the completion of the sale. Lucy gives an exasperated half smile. Fi stares at Lucy, utterly disorientated. What she is saying, what she is doing, is complete lunacy and yet she doesn’t look like a madwoman. No, Lucy looks like a woman convinced that the person she is talking to is the deranged one. “Maybe you ought to phone your husband,” Lucy says finally. He lies on the bed in his hotel room, arms and legs twitching. The mattress is a good one, designed to absorb sleeplessness, passion, deepest nightmare, but it fails to ease agitation like his. Not even the two antidepressants he’s taken have subdued him. Perhaps it’s the planes making him crazy, the pitiless way they grind in and out, one after another, groaning under their own weight. More likely it’s the terror of what he’s done, the dawning understanding of all that he’s sacrificed. Because it’s real now. The Swiss clock has struck. One thirty here, twelve thirty in London. He is now in body what he has been in his mind for weeks: a fugitive, a man cast adrift by his own hand. He realizes that he’s been hoping there’ll be, in some bleak way, relief, but now the time has come there is something bleaker: none. Only the same sickening brew of emotions he’s felt since leaving the house early this morning, somehow both grimly fatalistic and wired for survival. Oh, God. Oh, Fi. Does she know yet? Someone will have seen, surely? Someone will have phoned her with the news. She might even be on her way to the house already. He shuffles upright, his back against the headboard, and tries to find a focus in the room. The armchair is red leatherette, the desk black veneer. A return to a 1980s aesthetic, more unsettling than it has any right to be. He swings his legs over the side of the bed. The flooring is warm on bare feet—vinyl or something else man-made. Fi would know what the material is; she has a passion for interiors. The thought causes a spasm of pain, a new breathlessness. He rises, seeking air—the room, on the fifth floor, is ablaze with central heating—but behind the complicated curtain arrangement the windows are sealed. Cars, white and black and silver, streak along the carriageways between hotel and airport, and, beyond, the mountains divide and shelter, their white peaks tinged peppermint blue. Trapped, he turns once more to face the room, thinking, unexpectedly, of his father. His fingers reach for the red leatherette chair, grip the seat back. He does not remember the name of this hotel, which he chose for its nearness to the airport, but knows that it is as soulless a place as he deserves. Because he’s sold his soul; that’s what he’s done. He’s sold his soul. But not so long ago that he’s forgotten how it feels to have one.